The Administration, as part of its “Delivering Government Solutions in the 21st Century, Reform Plan and Reorganization Recommendations” (www.performance.gov), is proposing the merging of the U.S. Army Corps of Engineers (Army Corps) Civil Works with the Department of Transportation (DOT) or the Department of Interior (Interior). The Army Corps Civil Works program has three primary missions: commercial (coastal and inland) navigation, aquatic ecosystem restoration, and flood control and storm damage reduction. The “new plan” views the role of Interior as related to that of the Army Corps’ Civil Works, and hence as a basis for change. Interior administers various land, water, and natural resource management programs, some that interface with or have similarity to Army Corps activities. 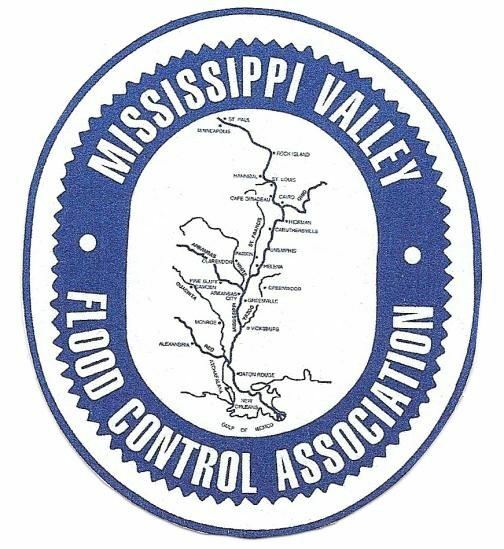 MOARC with sixty-five years and the MVFCA with eight decades of water and related land resources management know first-hand the vast differences between these agencies, their programs and approaches—and those far outweigh the similarities. Environmental permitting and ecological restoration compose the complementary efforts of Interior and the Army Corps. Under the restructuring proposal flood control and storm damage reduction could also be moved to Interior. Although the intent to integrate and align water resources programs is a worthy goal, consideration must also be given to an agency’s primary function and capabilities. Floods have long-been recognized as a threat to national security. For more than a century the Army Corps has strived to defend our nation against widespread floods like those in the lower Mississippi River basin. Since 1936 the Army Corps has been tasked by Congress with helping communities reduce flood damages through local flood protection works—a program that has directly led to the protection of people, property and productivity throughout the MOARC region and Mississippi Valley, and that has averted more than a trillion dollars in flood damages. This mission is not one that can be readily or effectively transferred to a department with neither a focus on defense and national security, nor on managing flood risk. While the MVFCA and MOARC respect the laudable intent of improved performance from our federal partners we do not see that being achieved through consolidation of the Army Corps’ flood control mission into Interior—a move quite likely to sink the local flood protection program. The predictable and almost certain outcome is largely diminished investment in building and maintaining infrastructure, and even more burdensome regulations. What’s needed is streamlined contracting, better options for stakeholder implementation, and infrastructure projects and repairs done faster (perhaps using Federal granting procedures, such as those employed by FEMA). Flood protection is crucial to communities throughout the Mississippi Valley and the MOARC region; cities, like St. Joseph, MO, Topeka and Manhattan, KS, Kansas City, MO and KS, and many others depend on it. Local sponsors seeking to invest in flood control infrastructure need a federal partner on their side that understands the importance of protecting communities and helps get sensible requirements that can be implemented in concert with, and not instead of, flood control and storm damage reduction. The Turkey Creek Basin project continues to move forward toward completion in 2021. 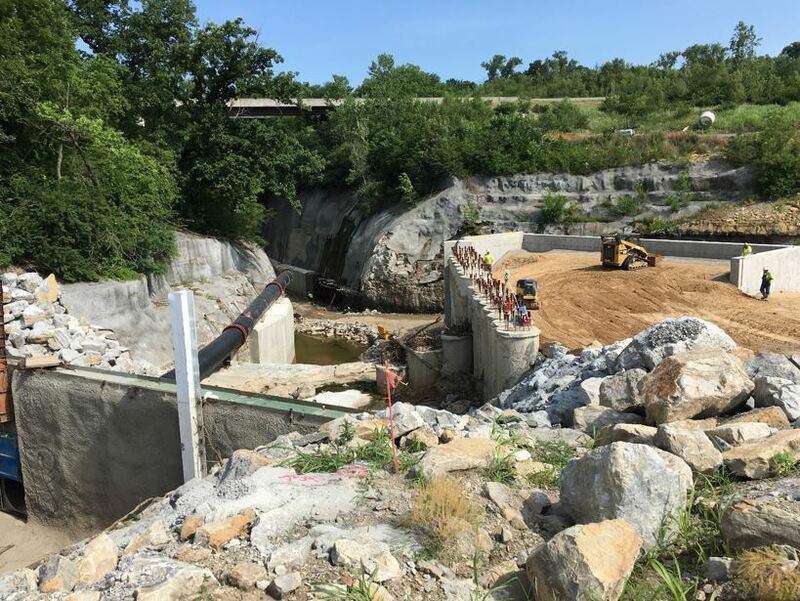 The Missouri Interceptor is the final project phase of the Turkey Creek Flood Damages Reduction Project and a major component to an integrated approach to flood control within the Kansas City metropolitan area. This final phase along with the completed Kansas Interceptors and Turkey Creek Channel Improvements will complete the 23-year project and provide significant improvement in flood control along Turkey Creek and the businesses along the Turkey Creek corridor within the Kansas City, Kansas and Kansas City, Missouri metropolitan area. The Missouri Interceptor project consists of improvements to lower Turkey Creek and construction of storm water interceptors to collect hillside drainage and convey it to Turkey Creek. These improvements include a levee extension; lowering of the creek at the tunnel entrance; a new dual outlet structure and storm water interceptors and associated inlets, and relocation of sanitary sewer and water main structures. Two construction contracts were awarded for the Missouri Interceptor and both contractors mobilized and construction activities underway. 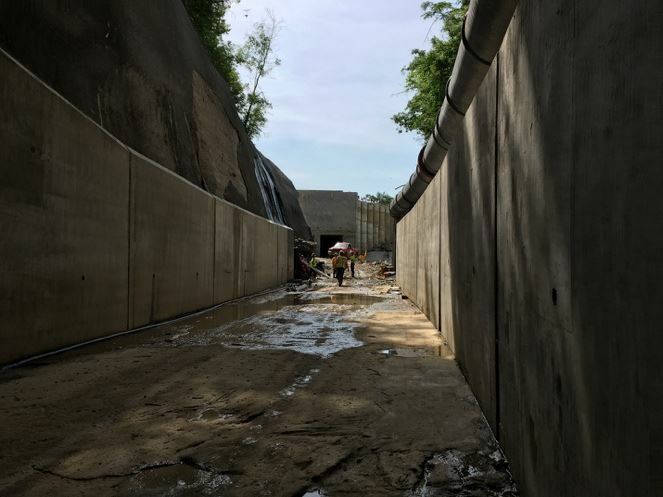 The Corps of Engineers reports that the outlet structure and first 300 feet of dual 10-ft by 9-ft reinforced concrete box structures have been installed and backfilling above the outlet is currently progressing. Placement of anchored concrete walls in the channel is approximately 60% complete. Backfill of the interceptor and construction of the levee using imported impervious fill is ongoing. Work has also begun on the sanitary sewer relocations necessary to continue the main interceptor section under BNSF railroad tracks through the Union Pacific rail yard crossing multiple railroad tracks. Relocation of the first of two existing sanitary sewers in the rail yards has been completed and excavation for the relocation of the second sanitary sewer line has begun. Partnerships between the governments of the two cities, the Corps of Engineers, congressional offices, local stakeholders and advocacy organizations such as MOARC and KCIC have set the stage for completion of this final phase of the flood control project. Completed construction of the initial phases of the project have provided significant reduction of flooding within the basin and with the completion of this final phase of construction expected in 2021 additional risks to lives and property along the Turkey Creek corridor will be realized. The Policy Workshop and project prioritization will take place on Tuesday July 31st, from 2:00 pm ‐ 5:00 with a social immediately following at the Husch Blackwell Law Offices, 4801 Main Street, 10th Floor Conference Room, Kansas City, MO 64112. Click on letter for more information. Lawmakers are pushing back against the Office of Management and Budget’s (OMB) reprioritization of the Corps of Engineers (Corps) Work Plan for 2018 Civil Works projects. The 2018 Work Plan released on 11 June provided much of what MOARC working with its partners across the region has advocated for in flood control for the region. However, a critical project for the future of the region, the Kansas River Basin study, was not included in the 2018 funding package. The Kansas River Basin study was advocated as a New Start project to look into operational changes on the Kansas River basin reservoirs to address future water supply requirements for the State of Kansas, as well as, additional downstream flood control opportunities on the Kansas River and its tributaries. The proposed study was prioritized by the Corps as one of the six mandated New Start studies across the nation. It passed the review of the Corps leadership and continued as a priority project through the Assistant Secretary of the Army for Civil Works, but was omitted from 2018 funding by the Office of Management and Budget. MOARC has taken exception to the reprioritization of the agency’s work plan by OMB and has sent notes to the regional delegation highlighting the concerns in OMB manipulation of an agency’s recommendations. When Congress curtailed its earmarking the intent was to have the agency act as the expert on project priorities and amounts to be funded out of the allocation provided by Congress. Several congressional offices apparently agree with MOARC as shown the article below that came out in Bloomberg Government on 18 June. Lawmakers to White House: Hands Off U.S. Army Corps Projects: If lawmakers don’t get to pick and choose their favorite infrastructure projects with earmarks, neither should Mick Mulvaney. That’s the message from House appropriators who hope to block the White House budget director’s authority to change Army Corps of Engineers construction plans. House appropriators unanimously agreed in a voice vote last week to insert a measure in their financial services spending bill, which includes general government appropriations, barring the White House Office of Management and Budget from amending the annual work plan developed by the Army Corps of Engineers. The measure is intended to push back against what appropriators see as arbitrary decisions to remove projects from the original plan developed by the Army Corps, said Rep. Mike Simpson (R-Idaho), who offered the amendment. The issue has become significant in the last “couple years” under the Trump administration, Simpson said. “They’re things that I guess Mulvaney doesn’t agree with,” Simpson said of the removals. “And that’s not his job.” OMB spokesman Coalter Baker didn’t respond to a request for comment. The budget office and the Army Corps don’t say what portions of the work plan are OMB suggestions, but there have been several instances during the Trump administration in which a partially finished infrastructure project was excluded from the annual work list to the surprise of lawmakers who had expected the projects to be included. The 2018 Civil Works Work Plan was released on Monday, 11 June identifying the water resource projects and programs to be funded under the 2018 budget. MOARC has been working with the Corps of Engineers (Corps) and the Congressional offices to ensure the Office of Management and Budget (OMB) understood the importance of regional flood control projects and the need to address future opportunities in water resource development. Swope Park construction - $14,482,000 in funds are provided for construction of Swope Park Industrial Area. The $14.5 million will complete Swope Park Industrial Area construction to completion. The projected schedule for completion is in 2021. Manhattan Levees design - $1,120,000 in funds are provided to initiate the Preconstruction Engineering and Design (PED). The Manhattan Levees project has been awaiting design funding since its authorization in 2016. Additional PED funds will be required in the 2019 Civil Works budget. Grand River Feasibility Study - $1,000,000 in funds are provided to continue the Feasibility Study. The Feasibility Study is expected to be completed in 2020 and eligible for authorization in a future 2020 Water Resource Development Act (WRDA). Kansas Citys Levees design funds – funding requests for design funds were not needed as Kansas City District was able to fund the design needs through unutilized program funds. Missouri River Operations and Maintenance - $8,964,000 in funds are provided to continue operations of the Missouri River Bank Stabilization Project from Sioux City to the mouth. Missouri River Recovery Program - $30,000,000 in funds are provided to continue efforts within the Integrated Science Program, funding of MRRIC, funding of the Yellowstone Intake project, and funding development of Interception Rearing Complex habitat for Pallid sturgeon and Emergent Sandbar Habitat for the Interior least tern and Piping plover. With these regional program successes, there are priority projects that did not get funded in 2018. Requested projects not funded in the Work Plan were the Upper Turkey Creek PED and the Kansas River Basin new start study. Congress directed the Corps to fund six new start water resource projects in 2018 with MOARC and KCIC working with congress to have the Kansas River Basin as one of those new start projects. We will continue to work with the Corps and Congress to ensure this new start is recognized along with continued design and construction funds for on-going 2019 projects in the congressional budget and Corps 2019 Work Plan. MOARC continues to monitor congressional action on a 2018 Water Resources Development Act (WRDA) bill and continues its communication with both the House and the Senate offices and committees regarding a 2008 WRDA bill. The Senate previously released its version of a WRDA bill providing opportunities for water resource development in the region. The House Transportation and Instructure Committee (T&I) released a WRDA bill on 31 May 2018 for the House of Representatives to approve in the near future. The House WRDA bill reflects general requirements for the Corps of Engineers to incorporate in its processes and report on as well as authorizes several new feasibility studies or construction projects across the nation. The WRDA bill recognizes the benefits of water resource development to the nation providing economic prosperity, national security, and environmental protection. The bill further states the intent to consider a WRDA not less than once each Congress. Making Harbor and Maintenance Trust Funds available to the Secretary of Civil Works for navigation purposes after fiscal year 2029 without further appropriation. Affirmation of Congress’ intent to use the Section 7001 process for consideration of future project authorizations and directs the Corps of Engineers to provide more effective outreach and assistance on the Section 7001 process for proposed authorizations. Clarification of the word ‘work’ in Section 408 to not include unimproved project lands. Unimproved lands would not have to have Section 408 reviews conducted if the Secretary determines there is no effect on a federal project. Direction of the National Academy of Sciences to conduct a study on the economic principles and analytical methodology used by the Corps of Engineers to formulate, evaluate, and budget for water resource projects. The analysis would address the methodologies in determining both benefits and costs in formulation of a plan and assess how the Corps is using the National Economic Development, Regional Economic Development, Environmental Quality, and Other Social Effects accounts in the formulation process. WRDA will continue to move formally through each congressional branch through the summer and a conference committee will be established to finalize a single bill, the conference report, for House and Senate approval. Upon passage by both chambers that could then become the WRDA 2018 bill and be sent to the President for review and enactment, which can occur with the President’s signature, or possibly without it in absence of a veto. MOARC will continue to track WRDA progress and provide updates to our membership and information to our Congressional delegation. 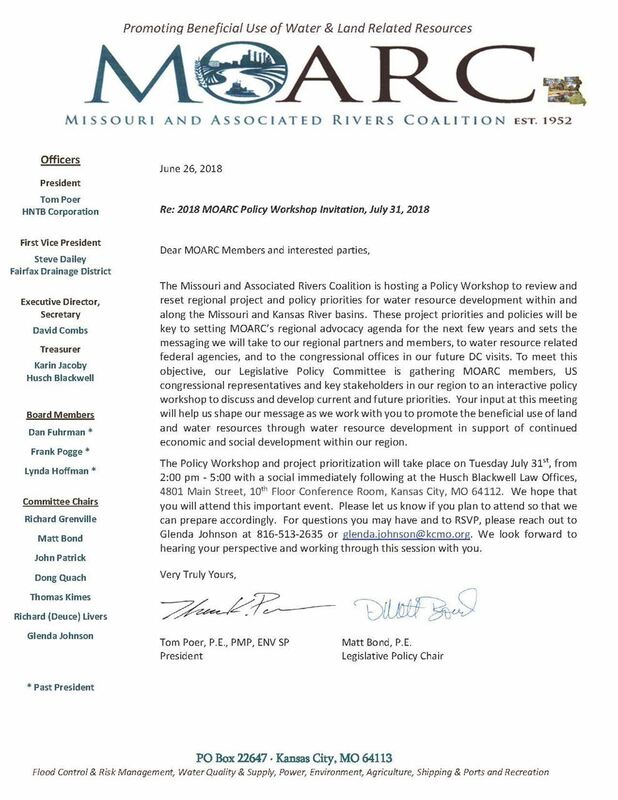 MOARC continues to engage with the Missouri River Recovery Program with a member participating as a committee member and advisor. The Missouri River Recovery Implementation Committee (MRRIC) met 22-24 May in Sioux Falls, South Dakota to address the status of the recovery program, the proposed recovery actions, and the completion of the Management Plan. The meeting in Sioux Falls was the 41st meeting of the Committee as it continues to review US Army Corps of Engineers (Corps) and US Fish and Wildlife activities and actions relating to recovery of three threatened and endangered species in the Missouri River. MRRIC addressed the draft five-year strategic plan developed by the two agencies. Committee members reviewed approximately 50 recommendations to the draft plan. Recommendations ranged from advising the for greater transparency and outreach to on development of proposed habitat projects, to evaluate the effects of natural high flow events on sturgeon spawning in the river, to ensure a scientific and systematic approach, and to address impacts on human consideration concerns from recovery actions. MRRIC will hold a webinar in late June to give final approval to the strategic plan. The Missouri River Management Plan that will drive the recovery program in the future continues to move forward. The Corps remains on track to issue a Record of Decision on the Environmental Impact Statement and Adaptive Management Plan by October 2018. The Final Environmental Impact Statement is scheduled to be released 31 August for a 30-day comment period. Navigation is one of the eight authorized purposes of the Missouri River that mandates the Corps of Engineers (Corps) to manage the navigation channel between Sioux City, Iowa and St. Louis, Missouri. The Rivers and Harbors Act of 1945 calls for a 9-foot deep and minimum 300-foot wide channel. Today, the focus of the Corps’ navigation mission is to provide safe, reliable, efficient and environmentally sustainable waterborne transportation system for movement of commerce, national security needs and recreation. In order to meet this mission, the Corps focuses on repairs to river structures from damage such as ice, debris, scouring and high water velocity. While several sections of the Kansas City District play a role in the navigation mission on the Missouri River, the Missouri River Area Office and River Engineering Section ensure the primary needs of the navigation stakeholders are met. The Missouri River Area Office, located in Napoleon, Missouri, performs operation and maintenance functions or oversees contracts for small river construction projects. A survey crew inspects the channel depth during navigation flow support season and responds to requests or concerns regarding depth or passability. The River Engineering Section, located in Kansas City, is responsible for inspecting and identifying structures which may require repairs, modification, or development of a new structure. During winter months, the River Engineering Section conducts low water inspections to identify what maintenance actions may need to be addressed along the river and place them on a list to prioritize and schedule for repair. To better help in maintaining the bank and channel to protect lands and provide opportunities of navigation, the Corps has used Geographic Information Systems (GIS) to modernize the 1994 Missouri River Hydrographic Survey books. The Corps has added and modified many river structures since the 1994 data; the updates currently show the full inventory and can help us report project conditions better than before. GIS provides information on the structure type, elevation, length and more. As such the Corps has developed newer Missouri River Bank Stabilization and Navigation Project maps, complete with GIS layers. This new mapping standard will help improve with efficiency of inspections and reports in the future. To better communicate with navigation stakeholders, the Missouri River Area Office distributes daily boat reports via email when traffic is on the river. Information is also shared frequently on the Missouri River Navigation Facebook page. Additionally, the Corps of Engineers, Northwestern Division hosts an annual navigation meeting to bring stakeholders and federal agencies together from across the basin to discuss Missouri River navigation, transport of materials, and the outlook for the upcoming season. With the available storage expected in mainstem reservoirs, the Corps expects full flow navigation support during the 2018 season. The Water Resources Development Act (WRDA) of 2018 continues to work its way through Congress, and MOARC and its partners have been actively working with both the Senate and House committees on legislative language to address water resource issues and opportunities. The Senate Committee on Environment and Public Works (EPW) introduced bipartisan water resources legislation on 8 May to address the nation’s water resource needs. The legislation, entitled “America's Water Infrastructure Act of 2018”, is intended to support the nation's economic competitiveness by increasing water storage, providing protection from dangerous floodwaters, deepening nationally significant ports, and maintaining the navigability of inland waterways across the country. The legislation will also repair aging drinking water, wastewater and irrigation systems. Within the proposed WRDA bill ARE projects and language changes advocated by MOARC! Significantly, the proposed language for combining previous authorizations of the Kansas City’s Levees into a single authorization to provide for more efficient budgeting and that the project not be subject to a new start decision were included. The Senate EPW also included the authorization requested for a study on the function and reliability of the Lower Missouri River Bank Stabilization and Navigation project. The future study would address current effectiveness and future needs within the lower Missouri River and determine additional opportunities for navigation, flood risk, and bank stabilization within the region. Additionally, the legislation would push the Corps of Engineers to fund the Continuing Authorities Program (CAP) at authorized limits, raise the authorized limit under each authority, and the total project cost limit under each authority from $10 million to $15 million. The change in CAP limits and the intent of Congress to see the program funded at greater levels reflects a greater opportunity for local communities, states and other entities to participate in water resource projects. This shows that MOARC efforts in coordinating with the Corps, stakeholders and Congressional offices, as well as advocacy partnerships, such as the MOARC and KCIC Congressional visits, are producing valued impact to our membership throughout our region. The House Transportation and Infrastructure Committee (T&I) is currently finalizing the House’s proposed WRDA legislation. The T&I Committee has been communication with MOARC regarding legislative language on several projects and future opportunities MOARC and KCIC have advocated. WRDA will continue to move formally through each congressional branch through the summer and a conference committee will be established to finalize a single bill for House and Senate approval. That legislation could then become WRDA 2018 and be enacted upon the President’s signature.